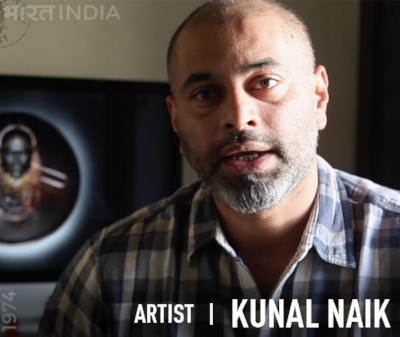 Kunal Naik is an Indian artist based out of Mumbai. He graduated with the Bachelor Of Fine Art (BFA) degree from Sir J. J. Institute Of Applied Art bagging the prestigious Government Gold Medal for his final year advertising campaign. He also was recognised as the most promising student of the year 1999-2000 and was awarded a Silver Cag along with several advertising agency awards. His professional career in advertising began as an Art Director in Saatchi & Saatchi moving on to Ogilvy. During his six year career in advertising he worked on brands like Tata Motors, Navbharat Times, Amaron Batteries to name a few and also helped his team bag a few national and international awards. Moving on from mainstream advertising in 2007, he shifted his focus onto design. He was appointed as the Creative Director for HiBlitz! a fashion-celebrity-lifestyle magazine owned by Dr. Vijay Mallya. During this period he was also nominated to design the visual identity and emblem for Indra Dhanush, a cultural initiative hosted by the Hon’ble President Of India at the Rashtrapati Bhawan, which pays ode to India's timeless culture and heritage through performing arts. Since childhood he experimented with art. With time his sensibilities matured and his hobby turned into passion. In 2012 he curated his first solo show at Arjun Khanna’s fashion boutique in Colaba (Mumbai), titled “In Search Of The Lost Chord”. The body of work created was in the tradition of sculptural paintings, and were later exhibited at The United Art Fair, New Delhi. Since 2013 he has been creating art in the tradition of Assemblage. Some works from this current exhibition were shown at The Edelweiss Palate Art Show 2016 in February, in Mumbai. His work was also a part of an art auction titled “ Art Beyond the Canvas’ that took place at The Bikaner House, New Delhi organised by Khushii (NGO) – A fundraiser for Girl Child Education. He also participated in the Appa Art Festival-- A K N Ramachandran Art Initiative held at the Mumbai Assembly, Bandra, in August 2016. He is also an integral part of The Art Village - An artist residency in Karjat, Maharashtra, where he exhibited his works last. His work has since been exhibited at India, Singapore and Europe.